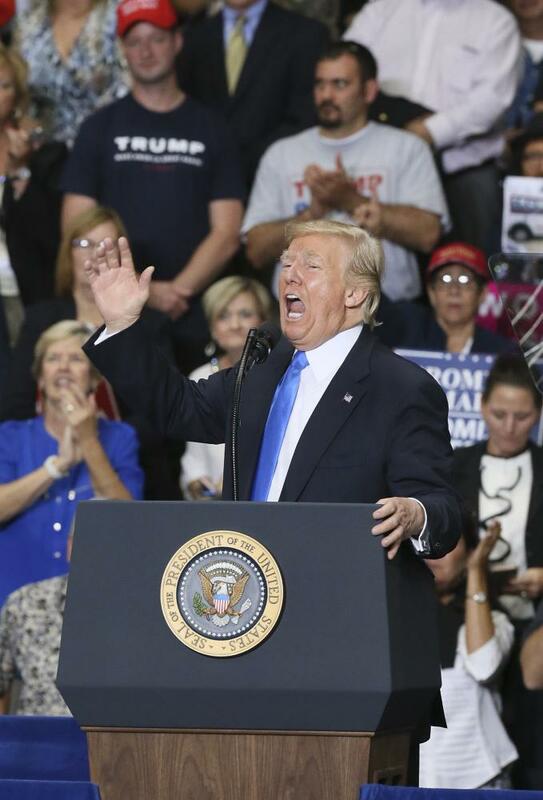 (Mike Cardew/Akron Beacon Journal/TNS) President Donald Trump shouts during a Make America Great Again rally at the Covelli Centre in Youngstown, Ohio, on Tuesday, July 25, 2017. On July 26th President Trump made a bad move for any hope of winning the LBGTQ community’s heart. However, they are not the only ones utterly disappointed by Trump’s latest military decision. On Wednesday, President Trump declared, via his Twitter account that “After consultation with my Generals and military experts, please be advised that the United States Government will not accept or allow…transgender individuals to serve in any capacity in the U.S. Military. Our military must be focused on decisive and overwhelming…victory and cannot be burdened with the tremendous medical costs and disruption that transgender in the military would entail. Thank you”, reported CNN. As to be expected, there have obviously been mixed reviews about this announcement. Many people have claimed to support this act by the President while others are in utter outrage. With many hashtaging #TransRightsAreHumanRights or #TransMilitaryBan, it is clear the country is divided over the decision. I have a lot to say about this, as I am incredibly disappointed that in 2017 we still chose to restrict people because of how they look or how they identify. I feel like our society should be so much more advanced but clearly I was wrong. Donald Trump has made headlines several times before now for his discriminatory behavior but it seems no matter how the people of America respond, Trump still acts in a way that I feel should have been left behind in history a long time ago. However, that is not what I want to discuss. I want to discuss how horribly one sided and inaccurate his claims are about transgendered people serving in the United States Armed Forces. First, let me just point out that he called the medical bills of transgenders a “burden” to the military. I cannot begin to tell you how disrespectful I find that comment but the only way to fight claims like that is with logic, facts and proof. Not to mention, Trump stated that the ban was due to the “burden” of medical expenses that transgenders require. I think that’s a sorry excuse as there is absolutely no basis for that claim. According to the Washington Post, the military spends way more money on medications like Viagra than they do on medical expenses for transgender soldiers. The Washington Post stated, “The military spends $41.6 million annually on Viagra alone, according to the Military Times analysis – roughly five times the estimated spending on transition related medical care for transgender troops”. The Washington Post also stated, “the Rand study estimated that these treatments would cost the military between $2.4 million and $8.4 million annually”. I am not undermining what that much money can do or what else it could go towards but compared to what the military’s budget is for medical costs actually is; medical expenses for transgendered troops is quite minor. The Washington Post commented, “we expect only a 0.13 percent ($8.4 million out of $6.2 billion) increase in health care spending” as originally reported by the Rand authors. I don’t know about you but when you spend $41.6 million of your budget on erectile dysfunction medications and then claim that transgender costs are too expensive; there is a problem. What can I conclude from all of this? Trump has no legitimate excuse for banning transgender soldiers. He claims it is about money, which doesn’t really add up. Personally, it looks to me like he was against having them in the service to begin with so he came up with this excuse to cover up his intolerance. Not to mention this whole ban makes him look very two sided. Not too long ago he was calling to the LGBTQ community claiming he would “fight for them” while Hillary Clinton brings more people that would threaten gay rights, reported the Washington Post. He took to Twitter about that issue too. The New York Times also mentions that he pledged his support for the LGBTQ community right after the Pulse nightclub shooting in Orlando. However, it appears that doesn’t mean much if he can’t stand by that commitment. Rights for the LGBTQ community has been a big issue not only in the United States, but also across the world. It doesn’t show much for the United States when the leader of the country bans a group of people from serving based on being transgender. According to the New York Times, Trump also stated, “Ask yourself who is really the friend of women and the LGBT community, Donald Trump with actions or Hillary Clinton with her words?” He continues by stating, “I will tell you who the better friend is, and someday I believe that will be proven out, big-league”. All I can say is that Trump’s actions have absolutely shown what kind of “friend” he is to the LGBTQ community. I mean it makes complete sense for the advocate and friend of LBGTQ community to take away their rights and freedoms, right? Surely, that is exactly what a real advocate does, at least from what he is displaying. He is clearly no friend to this community and I hope the American people can see how intolerant and discriminative this ban is. Serving is not about who you are; it is about what you stand for. The United States was designed for people of all walks of life and is supposed to represent that freedom. Therefore, isn’t it kind of against what this country is about to state that one group of people cannot protect a country they care about? Isn’t that the freedom of choice? Barring transgender individuals is the opposite of what America should be doing. We all equally deserve the right to protect a country we call home. However, in spite of all of this, I want to thank all of our service members. Thanks to you, I am able to write this article and discuss the things I agree and disagree with. Because of all of you, I am able to have the life I do have. I know many people undervalue the work you all do and while our President might think some of you are worthy and others a burdens, I think you all are heroes.